Tax-free weekend starts Friday in Texas. The three-day break lets families buy backpacks, sneakers and blue jeans with no sales tax. Tax-free weekend starts Friday in Texas. The three-day break lets families buy backpacks, sneakers and blue jeans with no sales tax, which seems like a straightforward way to save. Brakeyshia Samms is a state policy fellow with the Center for Public Policy Priorities, a research group in Austin. She’s a self-titled “unapologetic tax policy wonk“ and she says the tax holiday is a bad deal for Texas families. Here are her five reasons why she says that’s the case. 3. The holiday is open to tourists and residents in nearby states: “They’re not a contributing member to our state economy, which isn’t helpful for hard-working Texas families,” Samms says. 5. They don’t help the economy grow: “Consumers actually don’t spend more, they just time their purchases differently. So if there was no sales tax holiday, they would have bought the purchase any weekend,” Samms says. 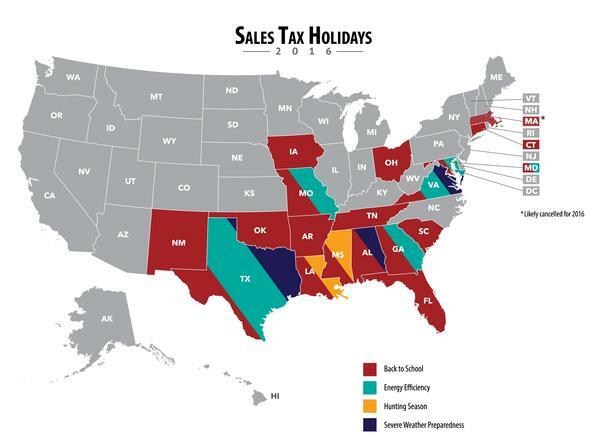 Check out this map of all the U.S. sales tax holidays, back to school and otherwise, from the Institute on Taxation and Economic Policy.